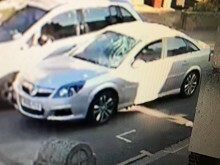 Officers from the Met's Serious Collision Investigation Unit are appealing for the public's help in identifying the driver of a car involved in a fail to stop collision in Leyton. Police were called to Church Road, near Goldsmith Road, at 14:48hrs on Saturday, 23 February to reports of a collision between a car and a cyclist. A 20-year-old cyclist was found seriously injured in the road. He was treated by paramedics at the scene before being taken to hospital. He is currently in a critical condition. The car involved in the collision, believed to be a silver Vauxhall Vectra, failed to stop at the scene. The car is thought to be a 2004 to 2008 model; it will have extensive front windscreen damage on the passenger side and will be missing part of its front bumper, as well as having damaged headlights. Detective Constable Mark Aken, from the Roads and Transport Policing Command, said: "The cyclist involved in this collision has suffered extremely serious injuries that have left him fighting for his life in hospital. "I would urgently like to trace the driver of the Vauxhall Vectra. Anyone who has seen this vehicle or has any information about the driver is asked to call 020 7232 7839 or email mark.aken@met.police.uk"